“Travelling” by Fiona Liberatore. Assemblage/Collage. Stimulating images, a chance for conversation, and the opportunity to arrange your own collection. All of those options are available at Saatchi Online. It is an online community where you can view artists works and discover new and emerging art in the art world. Formed in 2006 from Saatchi Gallery in London, it was created to “give artists not represented by galleries a platform to show their work to a global audience”. With a relaunch in 2010, it also gave artists the change to sell their original work and do print sales. On the webiste, there are exciting sections to view art! There is Showdown, which is an online competition for artists to showcase their work and go head-to-head with other artists, giving the winner a chance to display their art at the Saatchi Gallery in London; Collections, a group of images selected by Saatchi Online curators, artists, art fans and other community members for your viewing pleasure; and Weekly Roundup which is 20 randomly selected pieces of art picked from art around the globe for the audience to vote on. They also have famous guest curators choose works, such as Rachel Roy. I suggest you go on the sight and like Saatchi Online says: Discover emerging artists + affordable art from around the world including original paintings, sculpture and more. Within the entry are some of my favorite from the website! 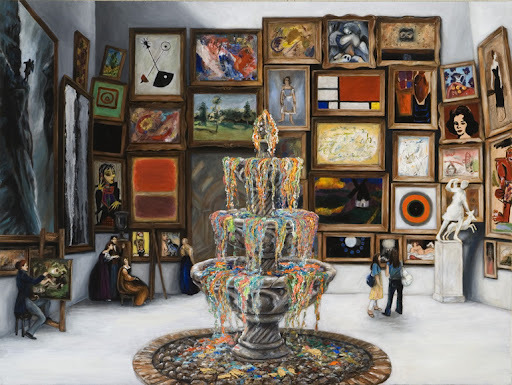 The Paint Fountain by Catherine Bennaton. Painting.